One of the great perks of being a Stampin' Up! demonstrator is being able to preorder new products a month earlier than everyone else. Today is the day that demonstrators get to order from the new Holiday Catalog which will become available to everyone else on August 1st. However, today Stampin' Up! 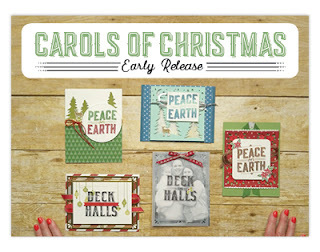 is releasing the Carols of Christmas Stamp Set and Thinlits Dies a month early for everyone. Now you can start your holiday cards a month early! You can go directly to my online store here to purchase these products! Below are a few samples, and a video made by Stampin' Up!. 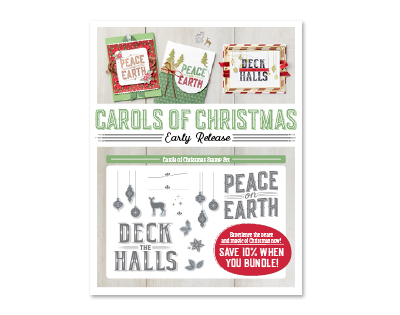 Both the video and at my onlines store you can see all of the products. And don't forget your can use any Bonus Day coupons you might of earned last month to help you save! Sample cards made by Stampin' Up! Below you will find a video made by Stampin' Up! that shows you the products in more detail.